Tristan 301 trawlers are a rare sight in the US but they are a well-regarded brand in Europe. Built in Finland to very high standards this double-ended solid fiberglass displacement pocket trawler draws attention wherever she travels. She is double ended with a full keel and dual steering stations. She is well equipped including a 2006 Yanmar with very low hours, Lofrans electric windlass, dual 100 amp alternators, dual RACOR filters. A 12,000 BTU Mermaid reverse cycle heat air system provides comfort anytime of year. Lovely green hull was painted in 2012 and her exterior teak was recently renewed. Offered at a fraction of her replacement value, this vessel is perfect for a family to explore the San Juan, Gulf Islands and beyond. West Florida Yachts would love to guide you through a personal showing of this 30' Tristan 301 1983. 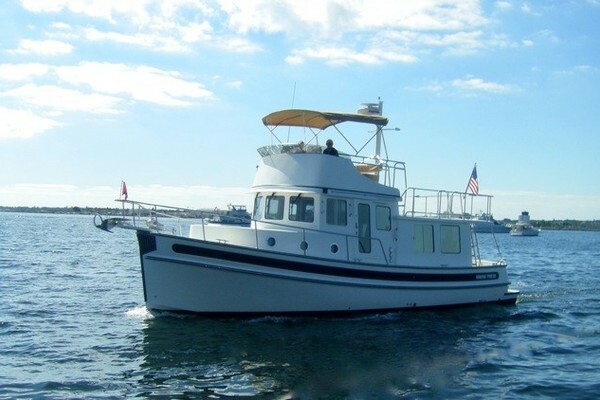 This yacht for sale is located in Bainbridge Island, Washington and priced at $49,500. For a showing please contact us by filling out the form on this page and we will get back to you shortly! Vessel is entered through either side of the pilothouse. The interior is warm and inviting with excellent visibility. A large sliding overhead hatch provides light and fresh air. The galley is forward and down on the port side. The large head is to starboard. All the way forward is a large v-berth. The pilothouse has seating capacity for 6 people with a large fold down dinette. Stepping down aft is a large double berth cabin. The pilothouse serves as the main salon and seats 6 people with ease. Large windows provide 360 degree visibility. An overhead opening skylight and dual entry doors provide plenty of fresh air. A large folding dinette table allows plenty of surface area for serving meals. There is storage under all settee's. Curtains throughout provide privacy when needed.